I know some of us have fished the salt with fixed line. Myself and Chris Stewart are the ones I know for sure. I think Adam Trahan, had a setup that he intended on fishing in the salt. Are there others here, and would you care to share your experience and discoveries applying fixed line techniques on the saltwater critters? Target species, equipment, and technique details are of interest. I am hoping to in Cornwall, UK in a couple of months, when I go there for a week’s holiday. I intend to target flounder and possible some of the smaller species. I know that a Utah Killer Bug will be one of the flies that will feature in the hunt for flounder. A couple of packets of White Nikko Sashi purchased from @CM_Stewart will feature in my search for micro species, together with a few small flies I intend to tie up. Hopefully I will give you a report on my success? @davidsr What rod and line will you be using in your setup? Definitely tie up some clousers. Stan Wright on Oahu used to post fairly frequently on the TUSA forum about fishing in salt water with a tenkara rod. Oddly I just discovered he co-hosted a tv show, “Let’s Go Fishing”, with Hari Kojima for a few years starting just a few months before I left Hawaii. I had no idea he was a tv personality there. Anyway, here’s an old post he did on TUSA forum, Tenkara Rod Barracuda Fly? That includes some advice from Chris Stewart and Stephen McGowan. 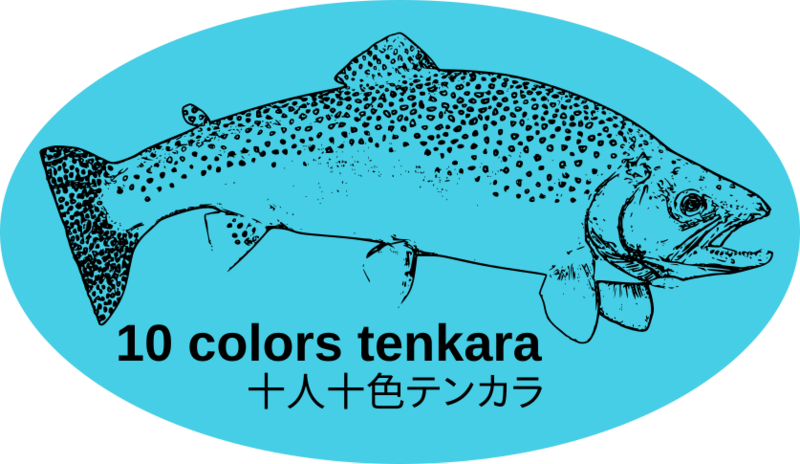 There may be other post by Stan about how he fishes salt water using a tenkara rod. 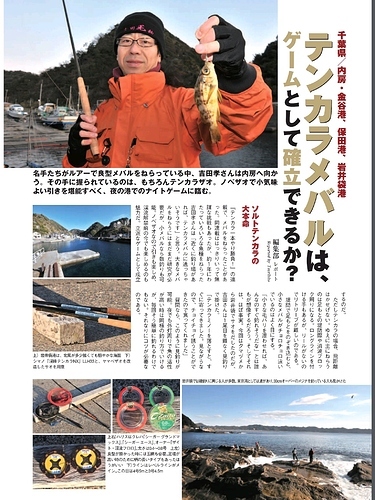 Many people would consider using a tenkara rod for salt water sea fishing as verboten. But it is done even in Japan. Do an internet search with 海テンカラ釣り and see for yourself. 海でテンカラやってみた！I tried tenkara in the sea. I like the kebari he ties. 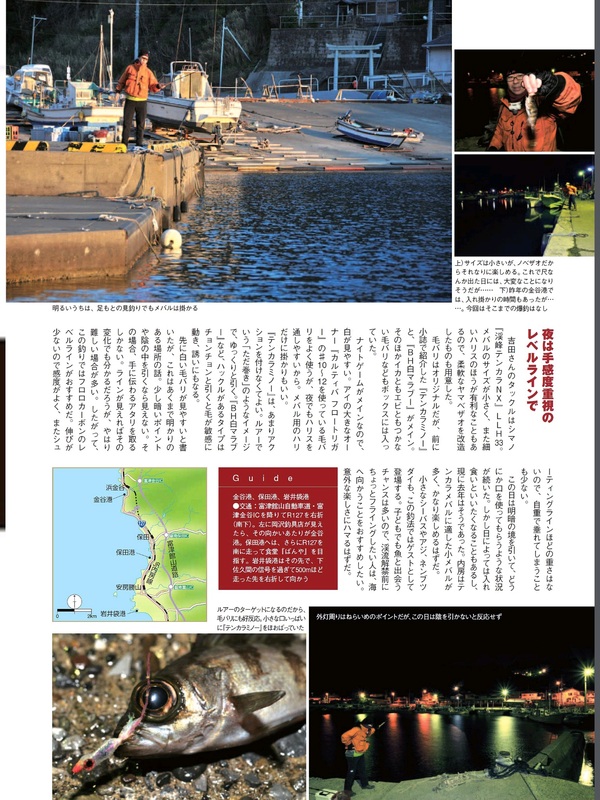 Sorry, photos from the magazine pages got random. Same story here too. On yoshidakebari blog. A friend of a friend asked me about fixed line in the salt. I thought it would be good to start a thread on the topic. I will try to do a post here on everything I have done and the techniques I have used. 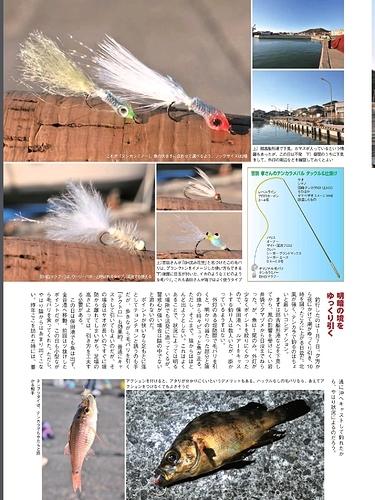 It is a budget Tenkara fly 12’ 7:3 rod which will do fine for saltwater. I have two spare tops for it. I will be fishing in the small harbour area, where I have fished a few times before, although then always with spinning gear. I use self tied jig flies, which I used to bounce along the bottom in the clear water. It was quite successful for flounder as you could see them suddenly appear and take the lure. There are also pollack which will take a fly in mid water. In the past I have targeted them on the spinning rod with a Deceiver type fly with a small weight in front. There is another youtube channel from Japan. And it has 2 video’s using a tenkara rod in salt water. @Horia Thank you. I really enjoyed watching both those videos. They have given me a few ideas for my holiday.